My trip to Slovakia in 2010 was for work, and it wasn’t spring, it was at the end of summer. When I wasn’t in the office, I was traveling the highways in my rental car. Slovakia, like many European countries, is very small compared to the Canadian provinces. On particular evening after supper, I took a drive. From the northwest corner of Slovakia, I was able to visit the Czech Republic and Poland, have time for pictures, and was back at my hotel in three hours. Try that in North America! Every day there was something new to see, somewhere new to go. I was there for two work weeks so I was lucky enough to have a full weekend to just explore. 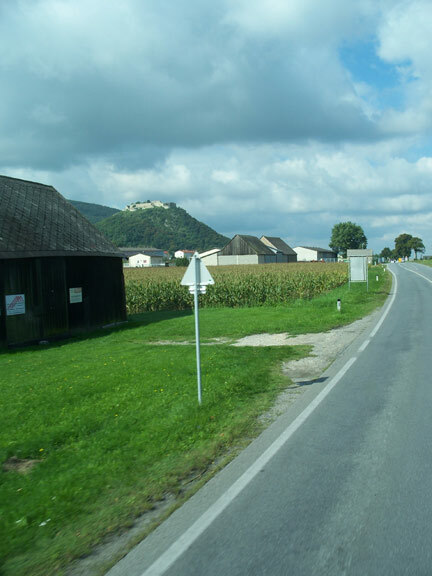 Slovakia is small, but there are always mountains around, as there are several ranges, and any drive off the highways will probably have you climbing up lovely roads canopied with the greenery of tall trees and stunning vistas below. 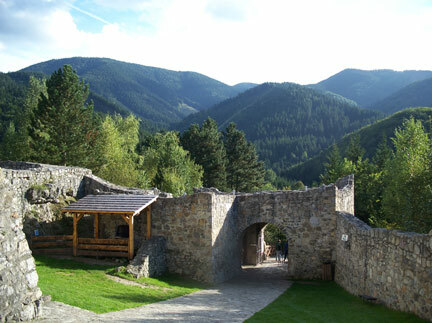 One of my pictures from Strecno Castle shows the mountains, and these aren’t even the high ones like the Mala Tatras. What Slovakia has that most of Canada doesn’t have is castles. Castle in spades. Strecno above is just outside the city where I worked. There was a castle in Zilina, where I worked. Bratislava has a castle. On the way to my work in Zilina after crossing the Austria/Slovakia border near Bratislava, I saw castles and signs to places with castles or ruins of them all along the way. 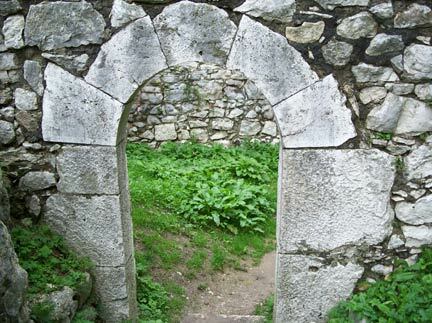 On one of my trips I tried to go to Bojnice Castle but got lost, and saw a castle ruin instead. During my stay I visited three and got close to another five that were on my driving routes. 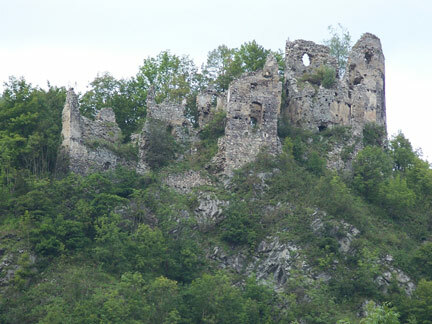 Some were simply old ruins now encroached upon by nature like Starý Hrad. 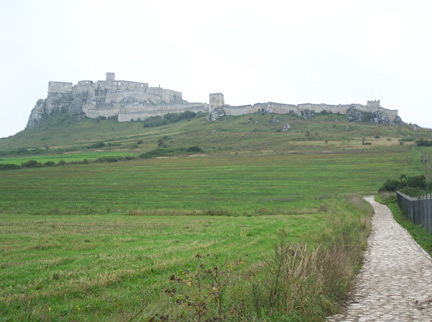 Some are well maintained and restored, like Spis Castle. Spis Castle is absolutely huge. In this image on the middle far right, there is a small brown blotch. That is a person climbing up to the castle. He’s about one third of the way up the path on the side from which the image is taken. I’m standing in the parking lot that I thought belonged to the castle. The real one is on the other side, only a short uphill walk to the entrance. From where I’m standing, it’s more than 4/5 of a mile to the castle, all uphill. I stopped to take my pulse on the way up, and I didn’t need to touch my wrist or neck. I just stood there and counted my entire-body pulses. Now, why am I talking about late summer, when this is supposed to be about spring inspiration? In April 2011 (spring! ), I went to Belgium for work. It was very different from Slovakia, but I was amazed at the greenery and flowers already blooming, having left on a bitterly cold, snow flurry day in Canada. While in Lier, I did the same as in Slovakia: I got in my car and drove to several other cities, exploring them all. This time instead of seeing castles, I was looking at the architecture. Almost every building had symmetry yet amazing amounts of curls and other details. Larger buildings, especially cathedrals that took centuries to build showed several different styles over the time of construction depending on the craftspeople. They often put themselves into their work, whether having their own visages as the faces of a gargoyle or making a statement by putting the faces of their enemies on them. The incredible detailing was especially apparent in Leuven when I stood in one stop and explored the carvings on the City Hall for almost an hour, my eyes moving from curves and lines to others. This is part of the inspiration. My own wire-wrapped jewelry is often like these buildings. It’s often symmetrical, but there are lots of details and curves, and a certain whimsical sense in the flourishes. You see this mostly only my wire-wrapped hearts. However, the trip to Slovakia and Belgium combined to provide the basis of my newer wire designs. They are larger in scale, such as necklaces rather than hearts, or they are more complex, made of several components rather than one stone with wires around it. They take more imagination, more work, and a more careful approach to design, but the flourish or creativeness is present in the finished piece. It’s always present, but until all the parts are assembled, it’s not readily apparent. Midnight In The Garden of Good And Medieval - blank annealed steel wire, garnet rounds, black jump rings and headpins. 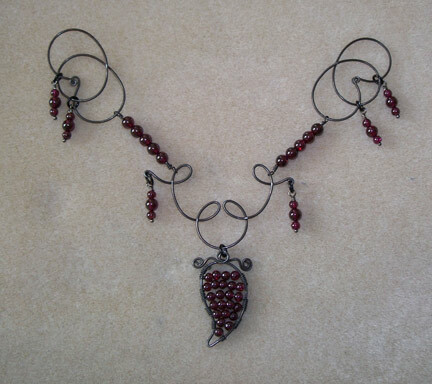 Garnet's use in medieval jewelry is well-known., and they certainly look like berries. A relatively fine black chain and a clasp finished this item, and then it sold immediately, before I had a chance to take a photo of the finished product. In the end of this part of the unending journey, I learned that inspiration doesn’t always happen in the studio surrounded by components that tell you how to put them together as I found myself doing for the last year. Always remember that art imitates life. Get out there and live it, examine it, record it somehow – a picture, a sketch, just a well-kept memory - enjoy it, remember it, be inspired.